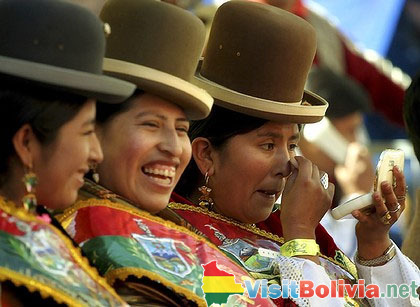 The festivals in Bolivia represent a mixture and a marriage of its rich indigenous history and the Roman Catholic religion, which has come to prevail in the country. They are typically expressed by means of rituals and dances and have become a popular tourist attraction because of the colorful costumes worn by the people and the interesting folkloric dances and processions. Even though some of the dances and the costumes worn have been modified through the years, the basic traditions and spirit of the festival remain intact - they are motivated by the belief that their prayers and petitions of prosperity, happiness and longevity can be granted. Virtually every village and town in Bolivia has a date set aside to celebrate their patron saint, or their gods/goddesses. This is why visitors to Bolivia can afford to witness such a celebration and spectacle all year round. In La Paz, for instance, there is the Achocalla in January - a religious party with tarqueadas, dancers that wear bread on their heads and chains of pears around their necks. There is the Urkupina Festivity in Quillacollo, Cochabamba celebrated for two days in August with a host of religious, folkloric and traditional celebrations dedicated to the miraculous Urkupina Virgin. Toward the end of May there is the Festival of Great Power (Festival del Gran Poder) in the city of La Paz, one of the best opportunities to see colorful folkloric Bolivian dance during the year. And of course there’s the Oruro Carnival, the most spectacular and famous traditional festival of Bolivia happening in February.